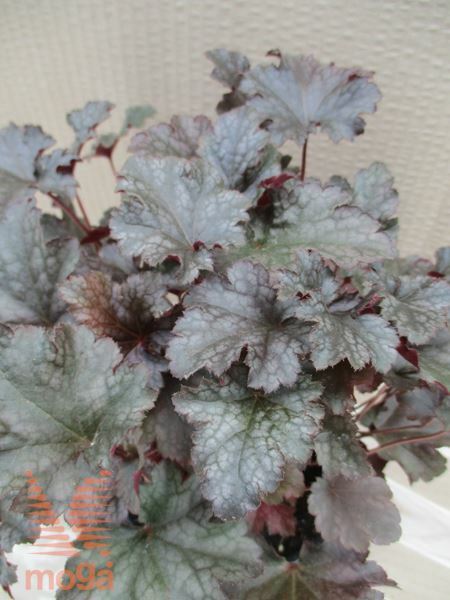 Small, dense, evergreen ground-covering perennial (H 50-60 cm, W 30-40 cm). Stems short, branched. Leaves with long petioles, broadly heart-shaped, palmate, 3-5-lobed, margin curled, glossy, variegated, light pink-grey, dark green veins. Flowers tiny, in upright spikes (up to 60 cm), white. Flowering period: June-July.